Have you heard the term Knowledge Base but aren’t exactly sure what it is? Simply stated, Knowledge Base is a way to develop content, manage how its delivered, and easily distribute it to your customers, partners, or employees. If you are looking for a way to provide easy access to information, lower your service costs, and increase your sales opportunities within your community, Knowledge Base is the tool to check out! It probably goes without saying, but with Knowledge Base, you can create process documentation, instructions, FAQs, or a host of other materials to streamline procedures or provide customer support. However, most people learn visually. With Knowledge Base, you can publish videos as well to ensure your customers and users are getting the information they need in the format that works best for them! The content you provide can go far beyond support though, you can use Knowledge Base for training, demos and marketing too. A comprehensive Knowledge Base can provide your website visitors, clients, partners, and service agents with convenient and valuable content whenever they want or need it. Let’s be honest, most people want to find the answers and information they need on their own. They don’t want to stop and call a customer service agent or even chat with a live agent. Most people want a fast and easy user experience where they can quickly search and find what they are looking for. Most companies prefer this as well as it saves time, money and helps improve the sales process! How do you deliver the content? Of course, someone needs to build the information your users might look for first. Internal writers author the articles and develop the videos or other content that is published to a range of possible channels both internally and externally. Users can search this content in the same way they do any other type of online searching, but you can control who sees the material you develop based on keywords. There are several ways to target articles to the correct people and make them easily searchable and accessible. Article types give you the flexibility to customize what fields you display for each collection of content. Determining what data you want captured and where you want it presented, will help users to quickly access information. Data categories, which allow for the classification of articles, are yet another tool that allows clients and partners to search more efficiently. They also allow administrators to control visibility, so information can be hidden when it is irrelevant for a group of users. While you are limited in the number of 5 data categories you can create, each data category can have 100 different values. Examples of data categories are products, lines of business, etc. So, how can this benefit your Community and business? Since Communities are branded websites or portals that allow customers and partners to access company information and interact with internal employees, implementing Knowledge Base within Communities is a natural progression. Salesforce Knowledge lets you create and manage documents and securely share them whenever and wherever they are needed. Knowledge Base can decrease reliance on customer support employees saving company resources and hours! Articles can be easily searched and available 24 hours a day allowing customers to seek answers quickly and efficiently at their convenience. 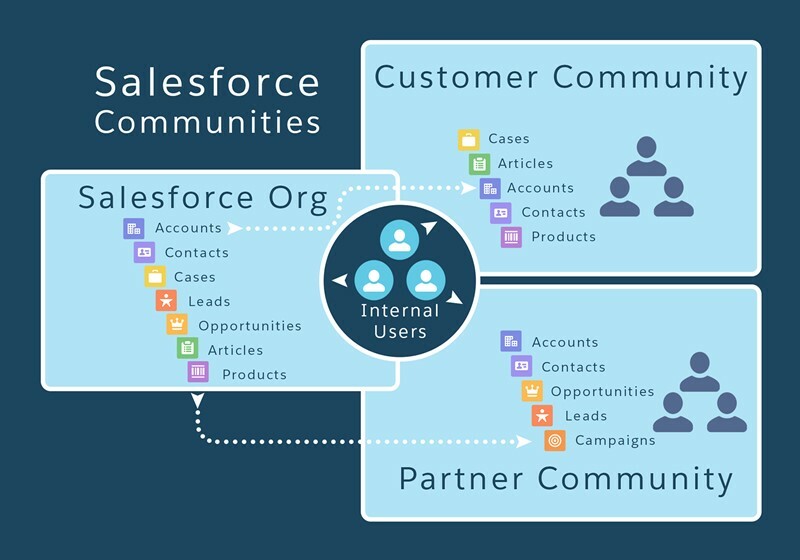 Partner Communities can expose partner related content such as sales processes, service advice and product content. Customers, on the other hand, might be interested in articles about how to install a product, or frequently asked questions, like how to do an upgrade. The knowledge tab provides an extra element to allow them to answer their own questions. You can even setup workflows so that before a case is even submitted, relevant articles to your query will be displayed based on the title of the case. Have you ever submitted a case through Salesforce? You may recognize this functionality! All this saves your company’s internal resources valuable time, so they can focus on other priorities! Finally, Salesforce allows for event monitoring of the Knowledge Base, so you know if your content is being accessed and how helpful and relevant that content is to your users. You can see which articles are being viewed and which users are accessing them. Imagine the potential opportunities for your marketing and sales teams with this insight! In addition, you can let users “vote” on the articles using a “thumbs up” or “thumbs down” icon to understand which ones need improvement and results in more customers getting service resolution without an agent involved, partners closing business more quickly and with less help from you directly, or more customers reaching out about a product they are interested in. Salesforce Knowledge Base can be a powerful tool for your business if you use and manage properly. It can lower the total of new service cases, enhance customer experience, and increase your sales. The sky is the limit! If you are interested in learning more about how Salesforce Knowledge Base can work, please contact us at salesforcesuccess@bayforce.com and we will provide a free consultation to discuss how Knowledge Base can help your business grow!